WARNING: During the 2002 legislative session the entire Little Sandy River drainage was rolled up into the Bull Run Protected Watershed. It is no longer legal to run this creek. Doing so could result in a $5000 fine and/or 6 months in jail. This trip report is merely a historical account of one of our trips down this creek, prior to the changes in the law. FYI: If you are angry about this, don't blame the lawmakers in Salem, blame the worthless bastards who went up and dumped trash all over the place at the put-in bridge (including appliances, etc). Illegal dumping greatly contributed to the closure. "I dunno what it is." the mechanic mumbled dully, eyeing his coffee. I ground my teeth in frustration, trying unsuccessfully to stay calm. "I just had it tuned up here two days ago," I said, getting angrier by the minute. "what did you do to my car?!?" He fumbled about while I seethed. "It's water!" the mechanic said triumphantly, finally showing a glimmer of intelligence. "and you really shouldn't be driving it like this." His eyes gleamed at the prospect of 'fixing' my car again. "Forget it." I growled. "Gimme my keys, there's plenty of water where I'm going..."
The Little Sandy is destined to become one of Oregon's premiere steep creeks once the dam (and gate) at the take out is removed. As it is the take out involves a grueling hike up a gravel road eight hundred vertical feet, which makes for a bit of a long day. 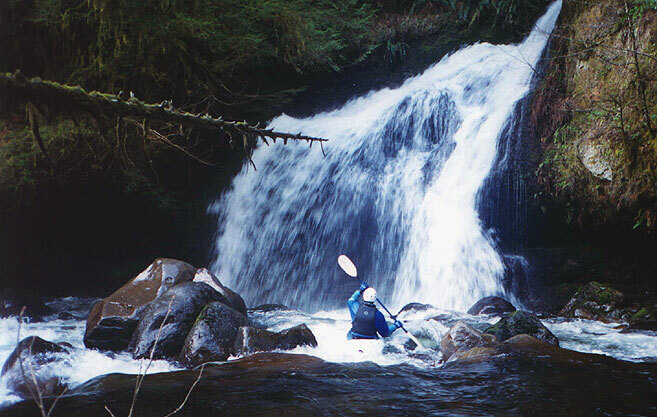 Pete contacted PGE and found out that it is legal to run this river, and that they are thinking of removing the dam as early as the summer of 2000. Pete has had his eye on this run for a few years now, and earlier this year he scouted the first mile and a half on foot. To our surprise he found a very clean creek with some nice drops and a 30 foot waterfall. He didn't continue below the big falls because the river twisted away from the road and plunged into a steep, vertical walled gorge. On the map the gorge looked to be about two miles long with an average gradient of 300 fpm. We put in at noon, (way too late!) and started down the first of many narrow boulder gardens. It was a beautiful day, and we spent a lot of time taking pictures and scouting. The upper section is lined with aspen and has an open, airy feel to it. It was often hard to stop up there- eddies were small so we often found ourselves running up onto rocks to scout. We were both paddling well though I flipped in a bad place at one point. Pete on the relatively easy upper section. As we approached the big falls we grew increasingly cautious. The riverbed became solid volcanic bedrock and we scraped and bounced down a long series of fun slides. Finally we rounded a corner and we could see the treetops below us, so we got out to scout. The big falls drops a total of thirty feet over a spectacular dome. Eddies are scarce above the falls, so we approached carefully. I briefly considered running the falls but found the line to be very thin- the landing is only about six feet deep and the pool is only about ten feet wide- if I boofed I would probably land on the far shore, and if I penciled in I would probably break my boat. We scouted the right side and it was totally choked with wood, so we lowered the boats down and hiked around the falls. Pete called this one Meatcleaver Falls because the likelihood of catastrophic injury is very high for those who choose to run it. Below Meatcleaver the walls closed in and the bottom dropped out as we entered the two mile long Boundary gorge. 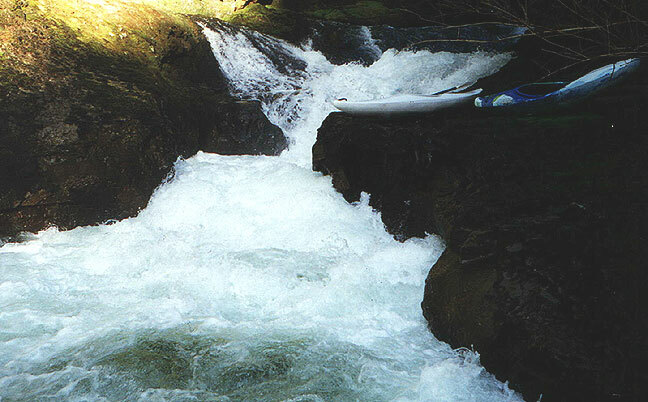 The rapids in Boundary are a whole order of magnitude more difficult than the mile and a half above the big falls. Soon we encountered the first in a long series of ledges and waterfalls in the ten to fifteen foot range. The boulder gardens in between were also long, steep, and hard. There wasn't very much wood, so we only had to contend with the ever present danger of pinning or missing an eddy. 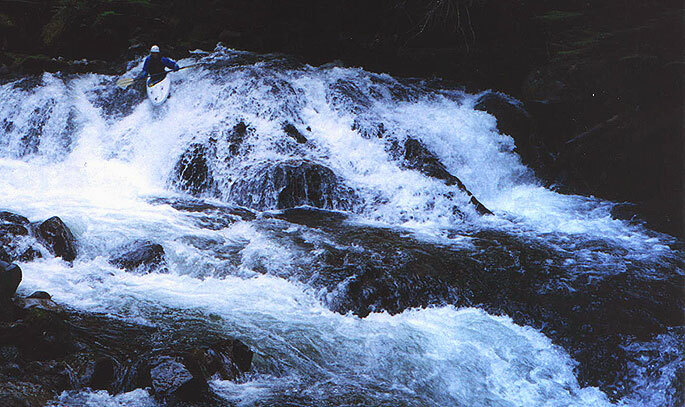 Most of the waterfalls and ledges had hard entrances, shallow landings, and long runouts. In addition, a few of them were not very runnable at this flow. 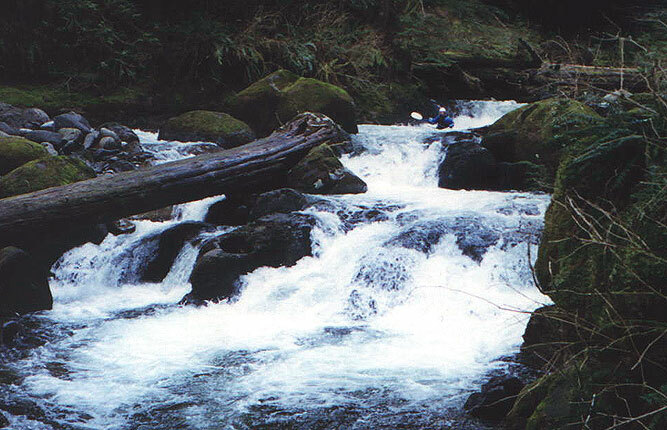 The first falls we encountered was a beautiful ten footer with a log vertically pinned in the chute. It was runnable, but if we missed our line we would be permanently stuffed under the log, so we portaged. Below here is a very steep boulder garden that ends in another long bedrock slide. Scouting in the gorge was pure pleasure- the walls are lined with old growth timber which means there is very little underbrush to contend with, and the open areas under the trees invite a longer stay- this is a very special place! 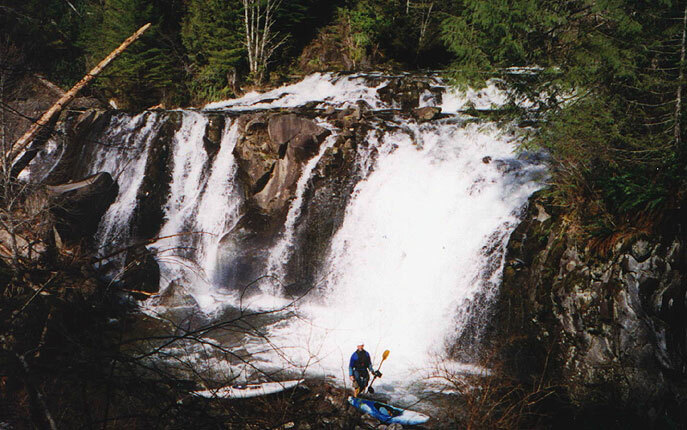 Just downstream is Hunchback falls, another broken falls with a shallow landing and a long, difficult runout. Pete ran first and hit the bottom hard so I angled right and boofed into the pool. Immediately below Hunchback Falls is a series of three ledges, pictured here with Pete at the top of the second ledge. Around the corner we caught an eddy and I got out to scout. I found another big ledge drop, but it had a log vertically pinned in it so we portaged. Immediately below here was another falls. As I approached it looked good but when we got closer we decided this was another portage- all of the water funnels down into a horrendous looking six foot wide slot with huge undercuts and bad hydraulics. We called this one Funnel Falls. Below Funnel are many more big, tough class IV-V drops. We ran most of them, finally arriving at the grand finale, Leap of Faith, a fifteen foot triple drop. The middle drop is the biggest, with most of the water forced to the left where it pours onto two large, sharp boulders. On the right a log extends out from the bank into the pool, so the middle is the only sane line. Just below the main falls the river funnels down into a twisty six foot wide slot that contains a powerful riverwide hole. I wondered aloud whether we should toss a log off the falls to see how deep it was and Pete replied "Forget that, I'm about as close to a log as you're going to get!!" (Since he was paddling his long boat that day I had to agree..) Anyway, Pete ran first and found out pretty quickly that the pool was only about six feet deep. He slammed into the bottom, recovered nicely, and dropped into the slot below the pool. As I stood by with a rope he disappeared briefly into the hole and then shot up downstream, doing a huge stern squirt in his full sized Corsica! I came down next and stayed off the bottom in my Gradient. I also managed to avoid the worst of the hole in the slot, correcting off of Pete's line. The last drop of the gorge is one of the most memorable... as we rounded the corner we were amazed to find a twisty boulder garden that has a waterfall pouring into it from above. 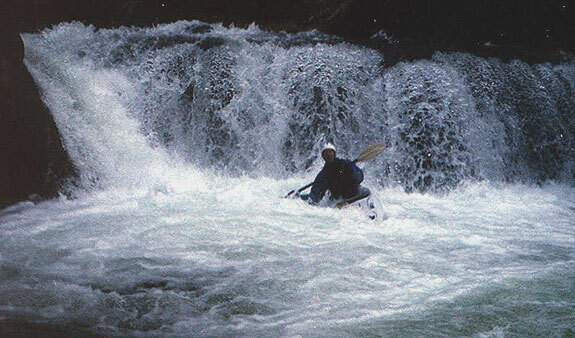 Pete made it through ok but I foolishly paddled directly under the falls and got pounded by the falling water.. It was fun! At this point it was getting pretty dark and we were having trouble seeing. "I refuse to sleep out here." Pete said grimly as we bashed our way down rapid after another. I couldn't have agreed more. The last mile was scary- It was now about seven p.m. and completely dark, with only the stars lighting our way. When Pete was leading he was easy to keep track of because most of his gear is white, but when I was in front he often lost track of me. We could see vague flashes of whitewater by the starlight but it was impossible to tell if there was any wood, so we swapped leads. At one point Pete got shoved under a log and then it fell on him. I could barely see what was happening and I beached my boat and ran down in the dark to help but he freed himself somehow. Downstream we portaged one huge old growth tree we saw at the last second and continued to work our way down to the dam. We were both near our psychological limit when finally we rounded the corner and had the yellow lights of the dam shining in our faces. The last small rapid was crazily lit by the lights on the dam and we blindly crashed our way down it into the pool above the dam. We rested briefly and celebrated our successful run, but we had one more obstacle to overcome: the truck was waiting eight hundred feet above us. With this in mind we clipped into our boats and began the long drag up the gravel road in the dark. We were both pretty exhausted by the time we got to the truck after the seemingly endless switchbacks and loose gravel, but we were also feeling pretty good after doing this amazing, obscure, beautiful run. Gradient: 90 fpm average, 300 fpm for two miles in the gorge. 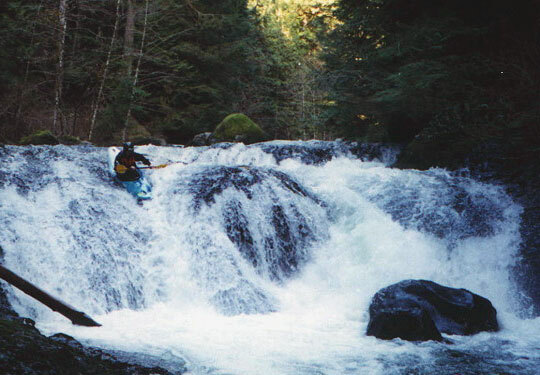 Character: Remote, pristine gorge with continuous, highly technical class IV-V rapids with must-make eddies above severe hazards. Access: To reach the takeout, turn left on Ten Eyke road on the east side of the town of Sandy and drive down to Revenue Bridge over the Sandy River. Cross the bridge and continue straight onto SE Marmot Rd. About 3.5 miles from Revenue Bridge you should see a gated road on the left with a "Authorized Personnel Only" sign. This is the take-out. The river is 800 vertical feet and 1.5 miles at the bottom of this gravel road. To reach the put-in, continue on SE Marmot Road another 8.7 miles or so and turn left on FS 14. Continue to the end of the road at the bridge across the Little Sandy. The Little Sandy is almost completely rain-dependent so you need a good strong rain to even consider it. The whole Sandy drainage also comes up very fast and drops very fast so timing is critical. I wouldn't want to be on this one when it was rising but it usually won't last more than a couple days when it comes up. Looking beneath the bridge at the put-in you should see water fanning over several of the larger rocks. 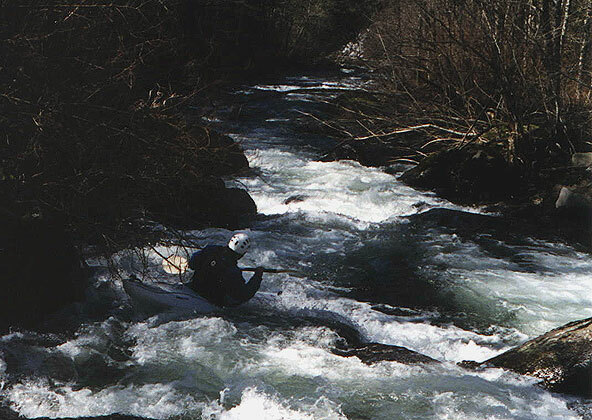 The rapid just upstream should look runnable but technical. If the rapid just downstream of the bridge looks like you could bump and grind through without getting out of your boat, the flow is probably adequate. If this rapid looks completely covered, you are in for an exciting day. Other Issues: As of the 2002 Legislative Session the Little Sandy is now part of the protected Bull Run watershed. This means it is no longer legal to paddle any part of the Little Sandy. Doing so could result in a $5000 fine, 6 months in jail, or both!